We first mentioned the “Elvis Cup” about six months ago and it made a small splash in the internet candy world at the time. The new Reese’s are set to release to the world next month and we received a shipment of them to give our readers a sneak peek at what to expect. 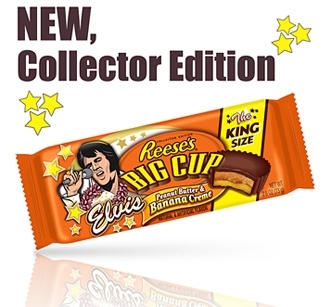 The Elvis Cup is a Reese’s cup with an additional layer of banana creme below the peanut butter. The banana tastes just like they put a real banana slice in there – they absolutely nailed the taste of a banana. Banana flakes are listed on the wrapper so the taste is real bananas. I am not a big fan of bananas in general (except banana Runts), so I really didn’t think I’d like these much. They definitely aren’t my favorite, but they are pretty good, even with the banana flavor. I can see a lot of people that like banana really enjoying these. The mixture of chocolate, banana, and peanut butter is not one I would think would mix well, but it actually does. Reese’s have really taken the “Limited Edition” title to a new level as these packages are labeled “Collector Edition”. “Hawaiian” Elvis is on the “King” size packs, regular size has two Elvis images – young Elvis and another “mature” Elvis, and the miniature packs have young Elvis in black with a guitar. Collectible? Why, yes – and tasty too! The Elvis Reese’s Cups should be available on store shelves sometime in July in mini, standard, and “King” size. get them while you can – whether you are a fan of Elvis or just love the taste of bananas and peanut butter. If you want to enjoy them before they hit stores, check out the collectible Elvis Cup Tin at Hershey’s Gifts. Yum! I can’t wait to try them. I’ve got high hopes for these. It’s one of my favorite flavor combos. This cracks me up. I love Reeces, and awhile back they came out with a Limited Edition Reeces that had marshmellow in it. It doesnt sound very good but I loved it, and then could never find one again. I dont know that I want to rush right out and try this banana Reeces but its a fun idea. Now I have to dust off my fry daddy! oh man luv it i hope it stays around forever..i have told everyone i know about them and they luv them.i found them in the general dollar only in texas.they are already on the shelves..yummy!!!! I ordered my Elvis tin two days ago! It will arrive TODAY! I AM EXCITED! I will probably sell the tin on eBay (I am not that big of an Elvis fan, but I LOVE Bananas and chocolate)… and eat all the nummy Reeseâ€™s banana cups myself… over time… like within a month….okay, a week. I HOPE I like them. Everyone should buy these! They are so good! Elvis Presley missed for 30 years, and will ALWAYS be missed….. The “Elvis tin” was VERY disapointing. It was a large gold tin, with a small 2″ round sticker on it of elvis in his Hawaii stage. Nothing else… just a stupid sticker. BUT THE CANDY IS GOOD! My whole family loves it. And it displays very well in my candy collection. A friend found one of these for me at a Dollar General in Virginia–mmm, mmm, good stuff! I have always loved this flavor combination (chocolate covered frozen banana, anyone?). And who could say no to Elvis? I TRIED IT, AND THEY ARE ACTUALYY REAL GOOD, I WAS SUPRISED. Good ol’ Dollar General comes through once more with a special candy item that other stores don’t carry. Yes, the ELVIS CUPS have arrived in Tucson, AZ! (Hmm, wait a minute…that doesn’t sound very appetizing, now does it? Kinda has an athletic assumption none of us really want in our candy). Well, anyway, I thought this was a great combination of flavors, textures and all-round candy goodness. Being that I like all three featured flavors, I loved this and was able to discern each flavor just fine. I did make sure to eat it indoors (ripped the wrapper off right at the register after I paid for it) since it’s 800 degrees outside here and it ain’t no M&M with it’s protective shell. It would’ve been like eating a Klondike bar on a tanning bed…you get the idea. Now, as someone who’s actually buttered and fried up her own peanut butter and banana sandwich (after skimming through an Elvis cookbook while hungry), and did indeed drink a big glass of Dutch Chocolate Milk with it, I figured I know what I’m talkin’ ’bout on this ol’ candy bar here. Reese’s has a hit with me and I hope this sticks around. Hey, besides the taste, it’s just plain fun to eat an ELVIS candybar! (Disclaimer: no hip swiveling or lip twitching took place while tasting this candy). It’s me again. I just got back from driving cross country. I can only find these bars at Dollar General. What’s up with that? Mmmmmmmm, just had my first KING CUP today. The bananna flavor was very subtle. I ate a cold one, and the other out in the 90 degree weather. I enjoyed the warm one a lot more. Absolutely Fantastic! I just ran across these in a gas station today, having been drawn in by the King cut-out display. I had to try them…and they didn’t disappoint! I’ve found a new candy addiction! My favorite candy with my favorite flavor combination in one package, and my favorite King! It’s heaven! I live in New Jersey (Central) does anyone know where to get the elvis collector’s edition of the Reese’s Peanut Butter & Banana Creme candy here? What stores they have them in? ALERT!! Okay, I love the BIG CUPs of this candy… but I just got a package of the Miniatures…. and they are TOTALLY different. Banana is NOT even an ingredient, and it is a coating only on the outer lower half of the cup… and it tastes like very fake banana. Why couldn’t they have just put a squirt of the banana filling from the Bigger cups? Why? WHY?!! I just had these Reeses Elvis Peanut Butter Banana cups like couple weeks ago. The Meijer gas station was selling them (2 cups) 5 for $1.00, so of course I was like hek yeah, 5 for $1.00, what a deal I was thinking, so I bought 5 and ate 4, great, hafta go back and look for more. Umm…I might give it another go with the big cups after reading that last comment…but the regular size cups taste like a peanut butter cup ate a banana laffy taffy. Yuck. The King would hate these!! The reason a PB&B sandwich is so good is the REAL banana taste…not this fake crap.